Fall is definitely in the air. The temps are getting cooler (still pretty warm in Texas but in Missouri they are definitely cooler) and the leaves are changing colors in Missouri (Live Oak and Mesquite tree leaves don't change in Texas). 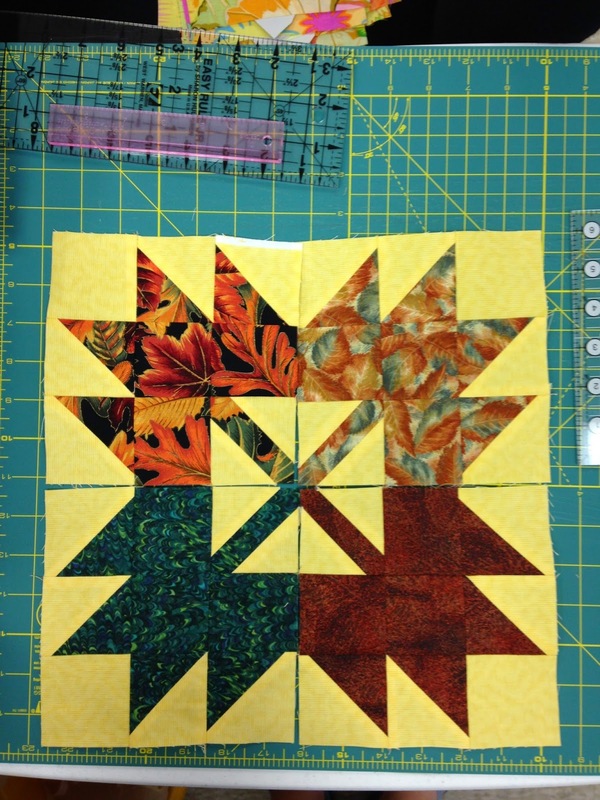 It's that time of month again for the next month's block in the Mystery Seasonal Sampler Quilt. 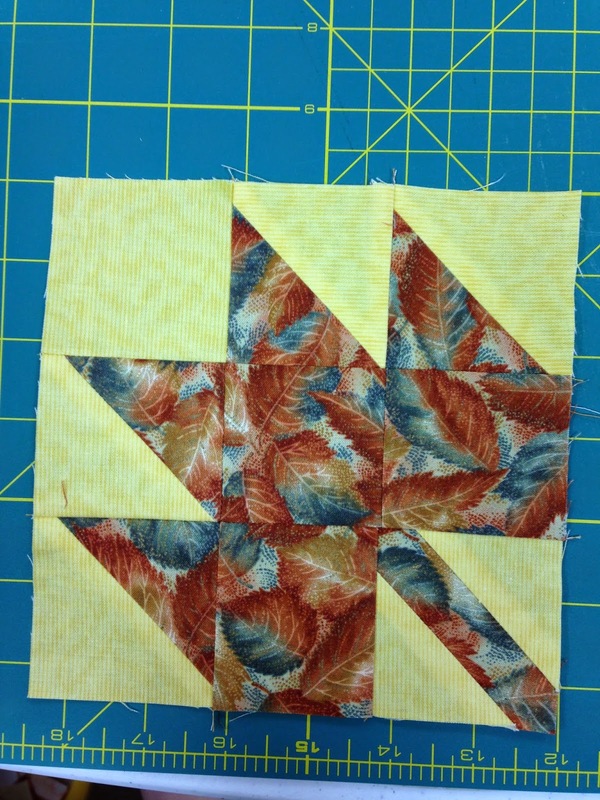 This month's block is "leaves". 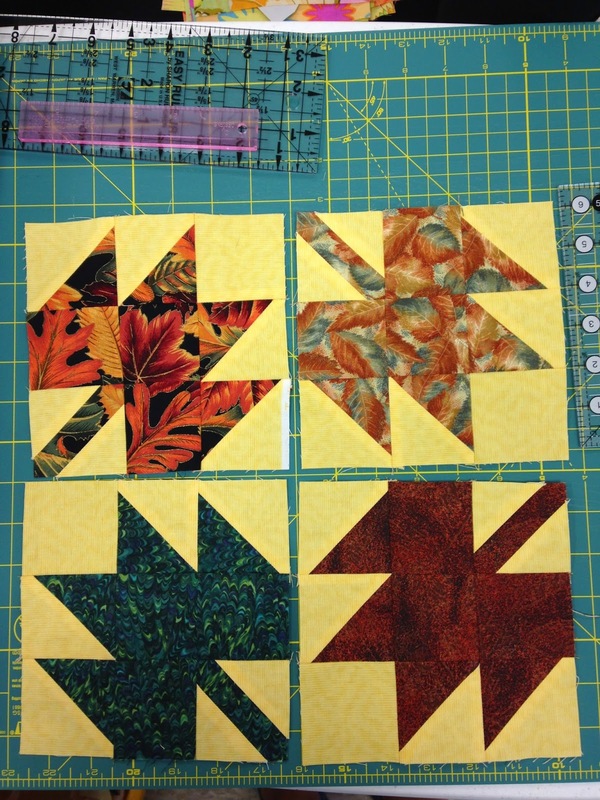 Pair the 8 - 3" background squares with each of the 4 prints. 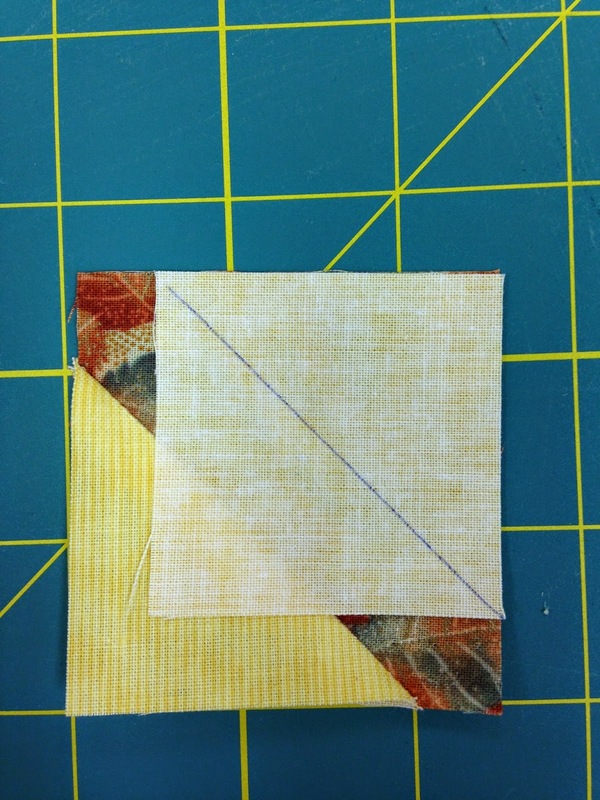 Draw a diagonal line on the background square and sew 1/4" from the drawn line on each side. 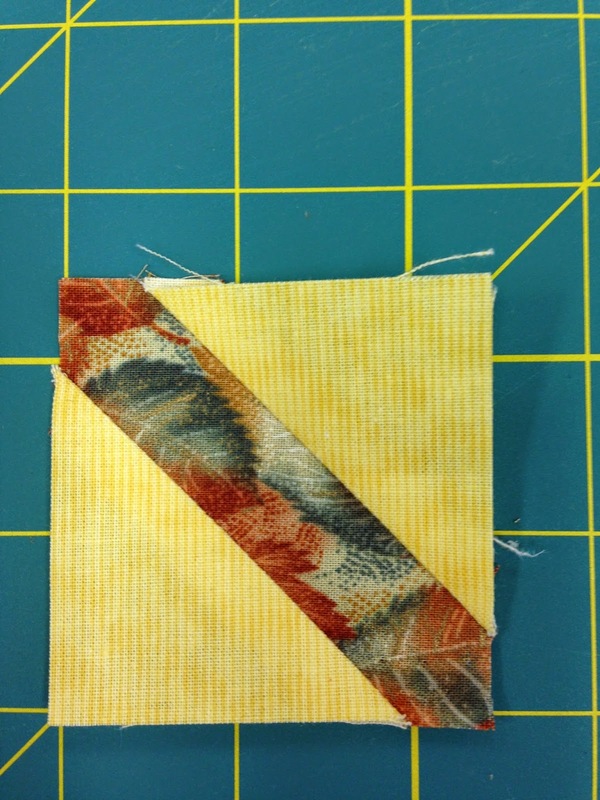 Cut on the drawn line and press to the dark fabric. 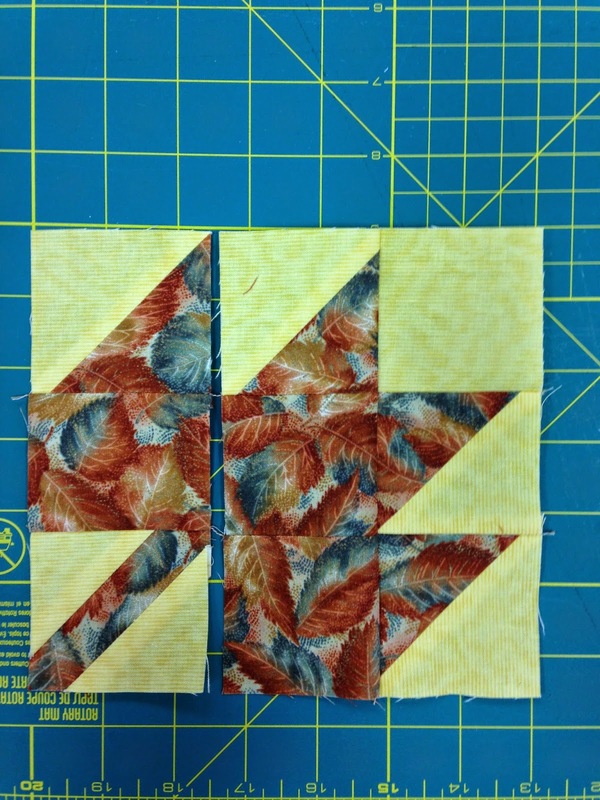 Square the half square triangles to 2 1/2". 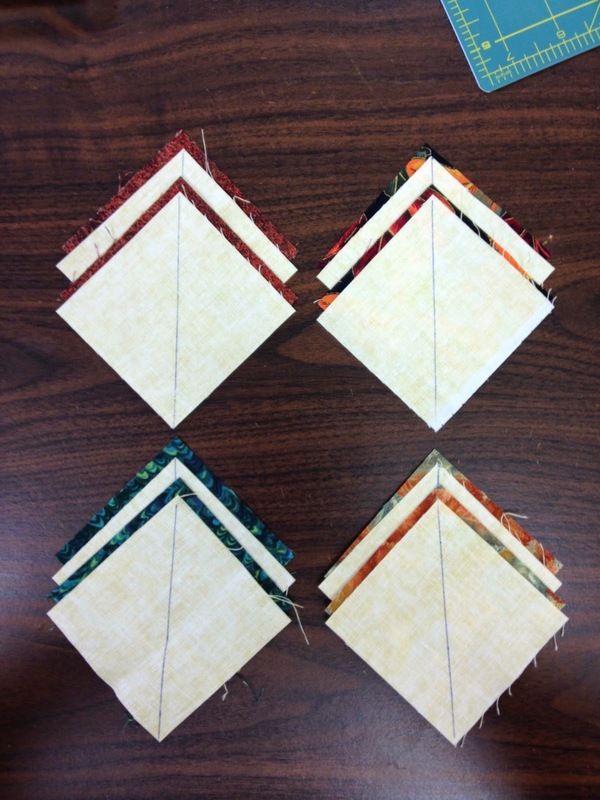 You will have 4 sets of 4 half square triangles in the 4 colors. 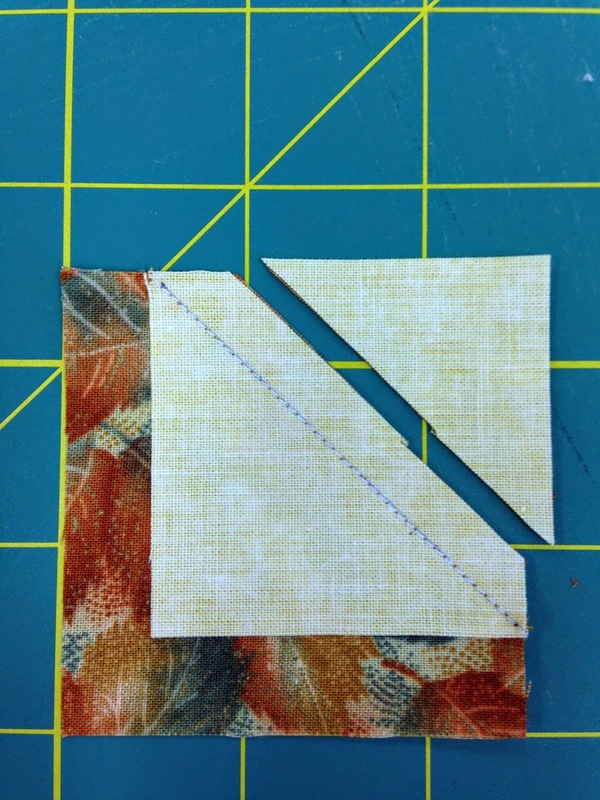 Draw a diagonal line on the back of the 8 - 2" squares. 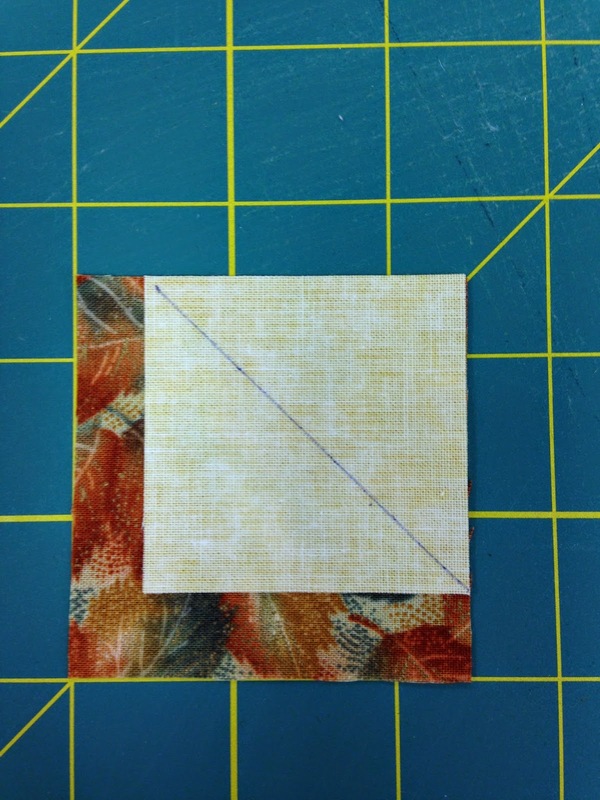 Lay one 2" background square on the upper right hand corner of one of the 2 1/2" print squares. 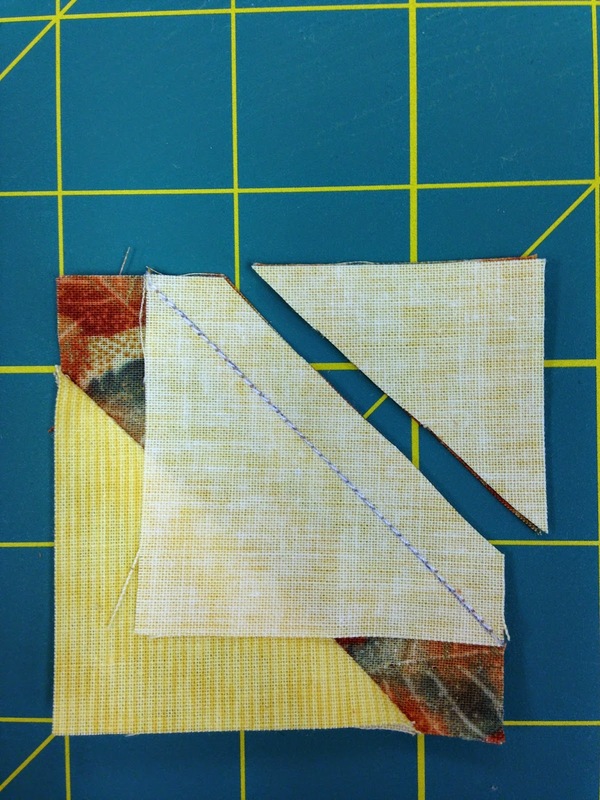 Sew on the diagonal line. 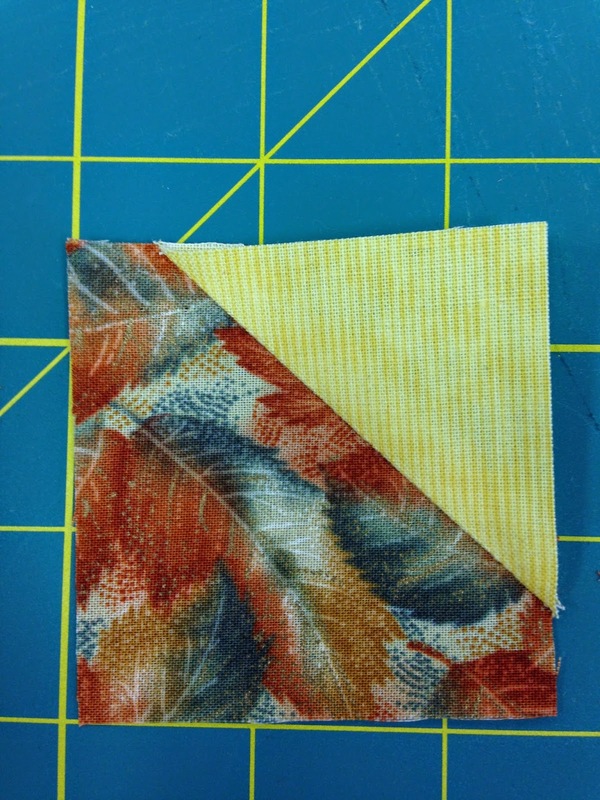 Trim off the excess, leaving a 1/4" seam allowance. Press to the background square. 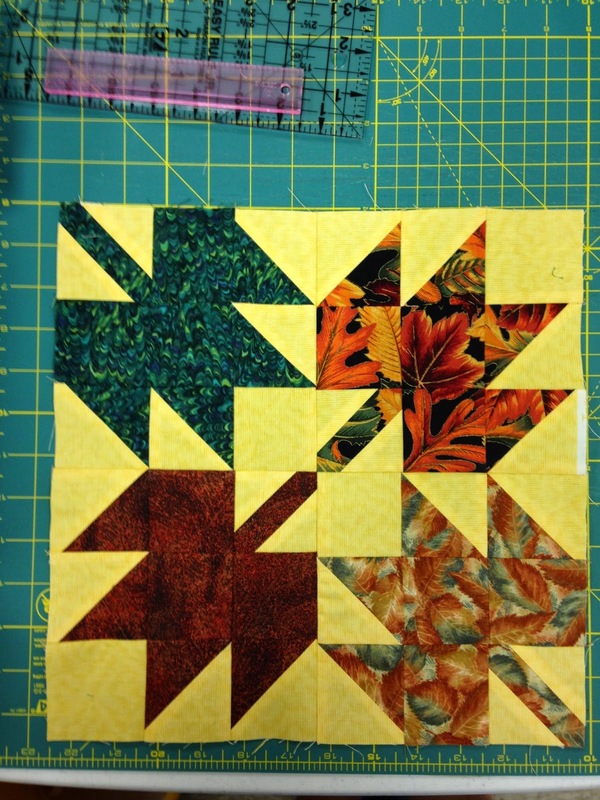 Now lay the stem unit, the half square triangle units and the remaining background and leaf squares out as in the diagram below. 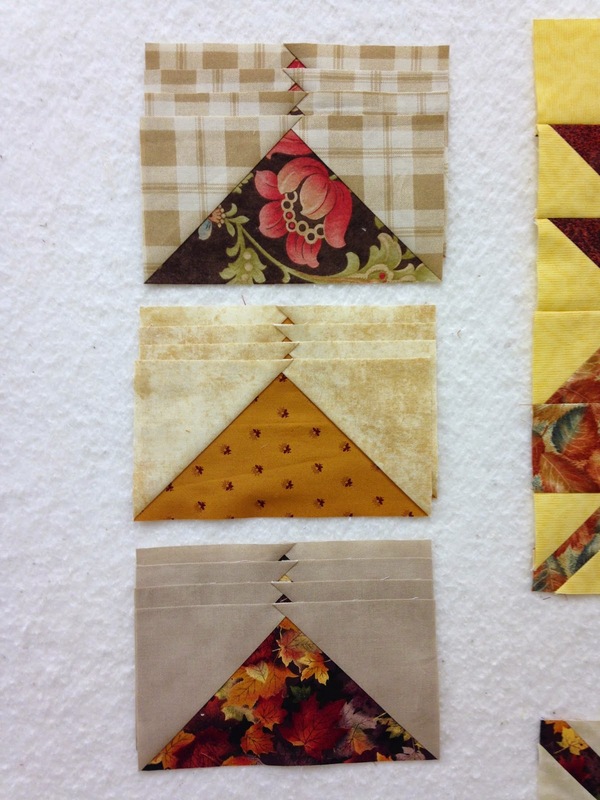 Sew each of the 3 rows together. 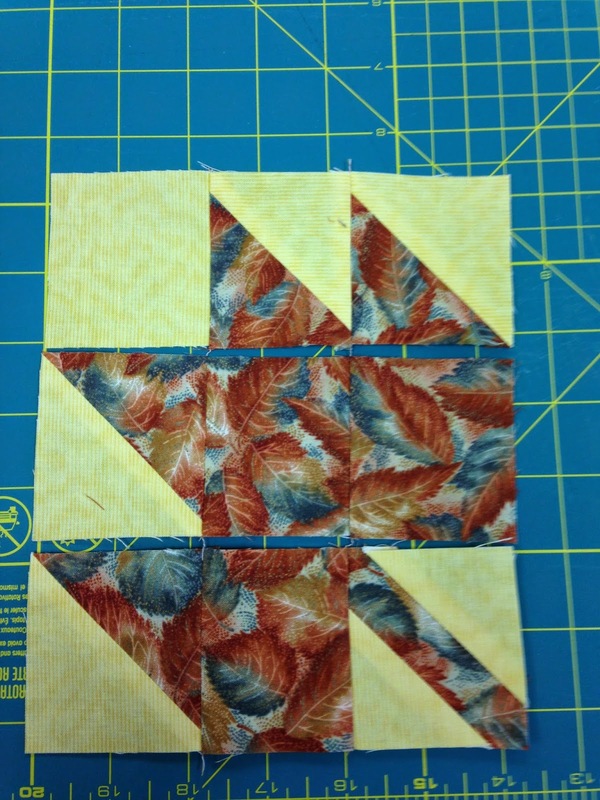 And then sew the rows together to form the leaf. It should measure 6 1/2" unfinished. 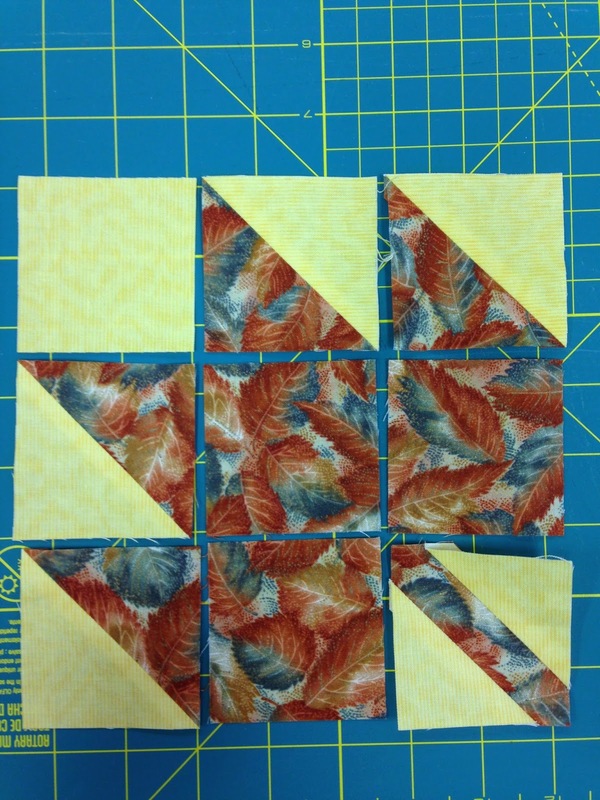 Repeat this for the other 3 color leaf blocks for a total of 4 leaf blocks. 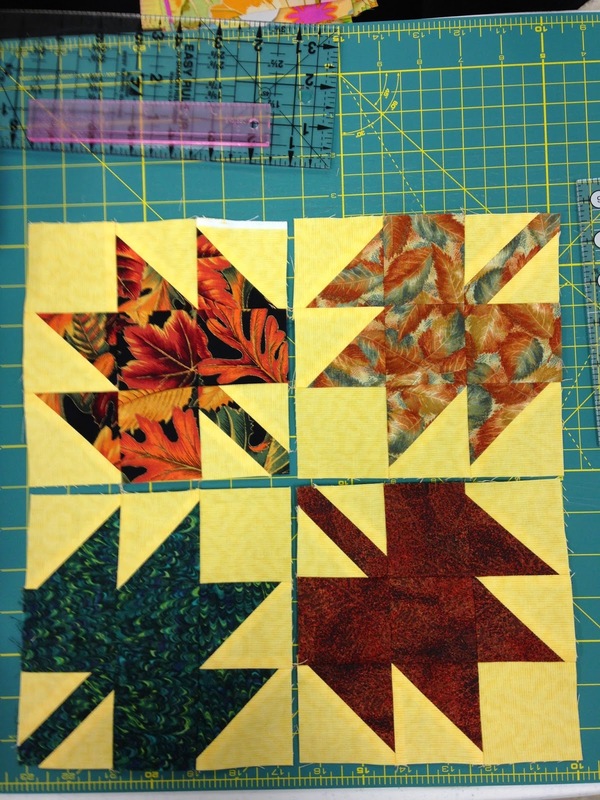 Now arrange the 4 leaf blocks as desired. You can twist and turn them as you like. 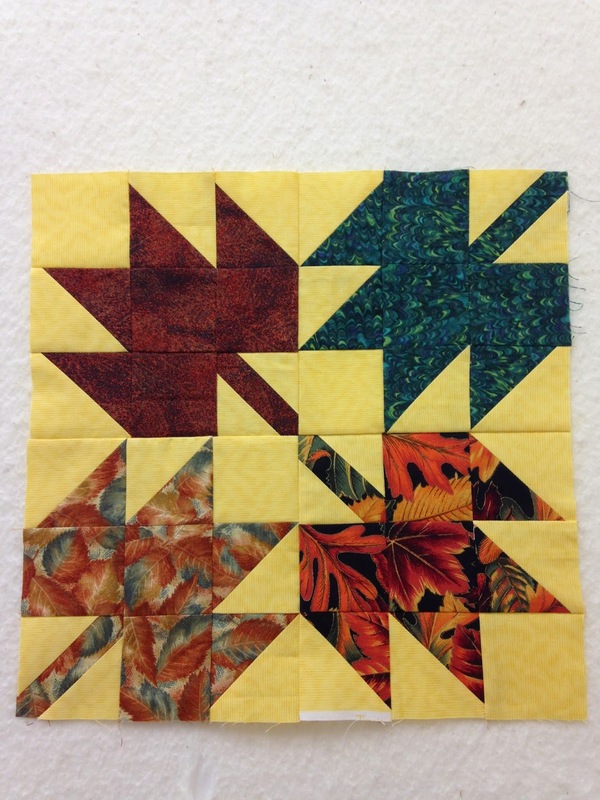 Once you're satified, sew them together in a 12 1/2" unfinished block. This is the second color way. They both are very similar. I couldn't stray too much from the fall leaf colors. I also made more flying geese units for both color ways. So how are you doing? Have you been keeping up? 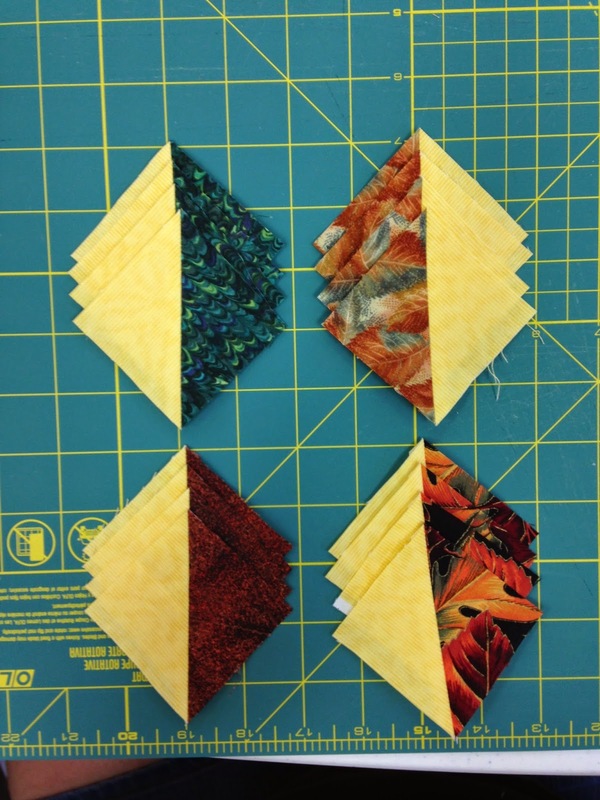 Have you been making lots of flying geese units? We only have 2 more months to make blocks and then the instructions for putting it all together. Don't jump the gun and try to figure it out. Just be patient. PS - Black Cat Crossing is coming! Are you ready? 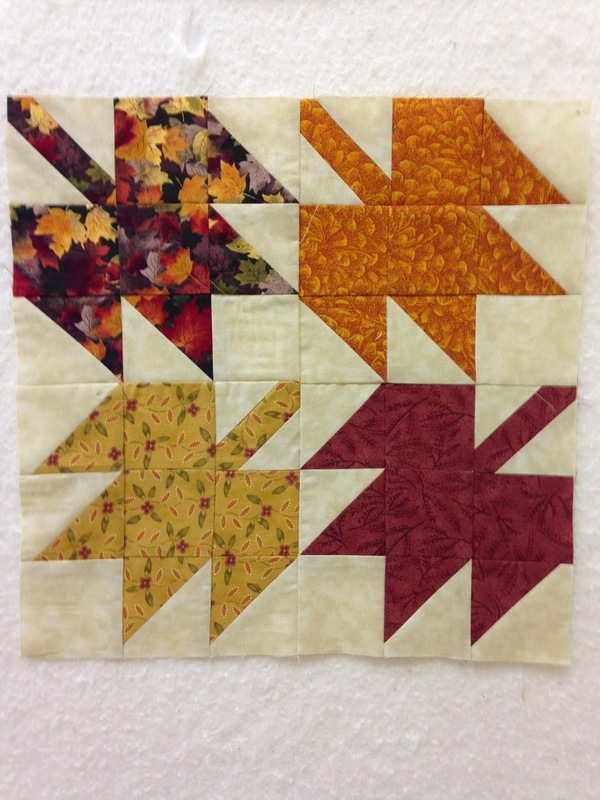 Beautiful fall colors and your leaf block is perfect!